Use Rubber Truck Mats to keep your Big Rig clean and happy. You know you like the smell of new rubber truck mats – don't you? OK, maybe you don't. In any case a set of new rubber floor mats for your big rig improves the visual atmosphere inside the cab and better protects the floor area from dirt, mud and liquids. Cleaner footwear for you and easier cleanup when coffee, pop/soda and soft ice cream is dropped on the floor. You pick a rubber truck mat for your big truck because you have a lot of water, mud or other mucky type things always getting onto your boots/shoes somehow. Who knows where all this crap comes from – it just finds its way to your footwear. So you want truck floor mats that are molded from rubber or a semi-flexible rubber like material. Raised protective borders are a great thing to have to keep the liquid mess off your carpeting. It's even nicer if the rubber mats you buy have channels or wells to trap the liquid stuff and keep it off your footwear. But if your mats aren't raised high enough to keep your boots dry you need to try out some universal absorbent truck mats. They'll reduce the mess and odors in your truck that come from sloppy, muddy floors. It's also pretty important to prevent the mat from slipping on the floor – so get a mat that uses nibbed backing or anti-slip ridges. Ya, I know, the question you really want me to answer is where the H do you go for more info on the aforementioned mats or other big rig stuff? How about Kenworth info , the Mack Truck accessories catalog, or Peterbilt rubber floor mat info to start? 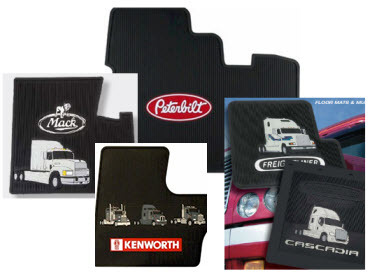 Oh, what the heck, how about just checking out the Product Sales Rubber Truck Mats website! They are a sister company of Plasticolor and have a great selection of logo truck floor mats made just for your big truck. And there are some new kids on the block. OK, they aren't really new, but they are starting to make waves. Ya, I'm talking about Minimizer and Averys. Minimizer is a family owned business in Minnesota that makes fenders, toolboxes, and other accessories for the trucking industry. But we are most interested in the floor mats these guys make. 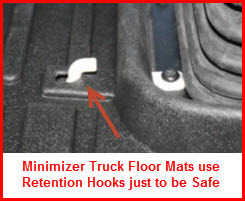 Minimizer starts with a thermoplastic mat that is designed to exactly fit your floor pan. A retention hook connected to the base of the shifter keeps your mat from travelling on its own accord. The surface of the mat is rough surfaced and the mat itself is easily removed and reinstalled for easy cleanup. The mat won't break or crack and comes with a lifetime warranty. Best of all it's made in the USA. Averys, heck everyone knows Averys. They make some of the best car, pickup truck and SUV floor mats in the world. 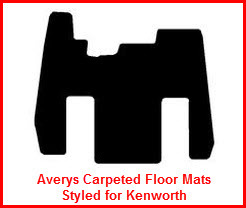 Now Averys has their name on some real fancy mats for your truck. I think this happened as a result of Fleet Interiors(who used to make truck floor mats) being acquired by Guardian Industries(who also owns Averys). Guardian either shifted the manufacturing to Averys or just replaced the old name with Averys. If I ever find out I'll let you know.